I made this card this morning in preparation for the blog post I'm about to write. We've had a hectic couple of weeks during the holidays, busier than usual with other kids birthday parties and our kids birthdays, play dates, visits from friends and of course, my parents coming over to pick up their caravan. I don't mind busy holidays. With a house full of kids, busy holidays can actually be better than really quiet holidays (our usual variety); where everyone has plenty of opportunity to get on everyone else's last, frazzled nerve - especially mine! Yesterday, even though to kids were back at school, we were still running around from dawn to dusk, so today was the first proper routine day and I was looking forward to doing nothing. Of course, it didn't quite work out that way, it hardly ever does, but it got me thinking about so many of my family and friends who are run off their feet with life and who sometimes, like me, feel the need to fib about being busy even on their quiet days just so they can actually have a quiet day! I know I have told people I can't catch up with them on particular day because I'm 'run off my feet' when on that specific day I have no plans. I do it because if I admit to having a quiet day planned, I might be viewed as selfish for not catching up with someone on that day when I'm always saying I can't catch up because I have so much on. Sometimes I fib because I need a break but I feel that will not be understood by the other person. Sometimes the problem is that other people do not perceive my life as busy because I'm not in paid work. I'm a mum and a writer. I'm a mum with three kids at school, so other than doing housework and tending to one at-home child, what could I possibly be doing with my day that keeps me run of my feet, they wonder. It's funny, sometimes I can't even tell people. Today, for example, I've been on the phone all day. I've been trying to sort out my mother-in-law's Myki card, this has required calling several departments who mostly had no clue how to categorise MIL for a card, though eventually we worked it out (I worked it, I should say, and then told them, and they agreed, thank goodness!). I also had to call MIL several times to clarify things - because you never know what questions they might ask you before you call each department. This has taken hours of my day! Other days, I try to do research for my PhD proposal, or chase up utility account issues (their mistakes) or Centrelink (because they randomly increase or decrease payments and I'm never quite sure why), or the kids schools. There is always something, and most of it is paperwork. It is no joke to call a housewife a manager, not just of little people or partners, but of all the sub-contractors of the household; the utility companies, the gardner, the agents (if you rent), the council (if you own). There are school applications to process and exhibitions (or performance if you child performs) to arrange for and homework/projects to oversee. We're trying to buy a car somehow and researching all that goes into that and the many ways in which one can get one's mitts on a car (legally, of course) is time consuming. Oh, and writing, well, that should be a top priority but often because it requires a certain creative energy it gets set aside for more pressing - and mundane - matters. Once I'm doing the doctorate, I know I will have even more to manage. That frightens me. At the same time, the doctorate is a means to an end and it could be very beneficial to our family, even in the short term. Sometimes though, there is a lull in the busy-ness, and it never last long, so sometimes I find myself 'run off my feet doing very little at all' so that when the lull fades away there is something left of me to take on all the busy-ness again. 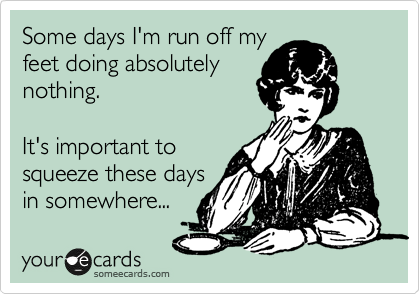 Do you fib about being run off your feet some days - just so you can catch your breath? Yep, I do it too - just to get a break from people... it's the introvert in me. Yeah, it may well be an introvert need - though, I think anyone can feel tired and just need a day off here and there. Jayne, honey, if you fibbed to me, I totally wouldn't mind, though you can rest assured that if you had a quiet day that you just needed to enjoy in peace, you could absolutely say that and I wouldn't be upset!